A “bunion” is the lay term that describes an enlargement and deformity of the big toe joint. The deformity arises because of a progressive dislocation of the big toe joint, which causes the toe to move towards the second toe. At the same time the 1st metatarsal (long bone) moves in the opposite direction which creates a bony lump on the inside of the foot. The pain and swelling you experience with a bunion are as a result of shoe pressure against the bony prominence and/or degenerative arthritis within the big toe joint. Occasionally there will be an associated bursitis (inflamed soft tissue sac) present overlying the big toe joint, which will add to the present discomfort. 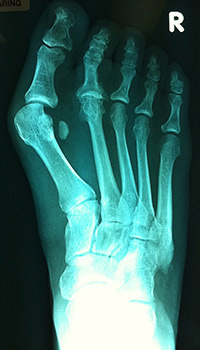 As the bunion deformity worsens, the big toe joint becomes more arthritic from being in a chronically subluxed position. Live with the problem and avoid excessive pressure from footwear. Use a functional orthotic (shoe insert) to off-load the inside part of the foot and do various exercises to strengthen the muscles that control foot function. Sometimes the use of splints or toe separators in indicated. Surgery to correct the alignment of the big toe joint. In most cases conservative treatment is recommended however sometimes the bunion deformity is significant and not responsive to orthotics, so that surgery is the best treatment option. Surgery usually involves making a cut in the 1st metatarsal bone, and repositioning the bone into its corrected position, whilst also stabilizing the ligaments and muscles around the joint. It usually is a day surgery or overnight stay procedure that requires you to wear a special protective sandal for about 6 weeks. Swelling and discomfort typically occur for 3-6 months afterwards. If you have bunions which require surgery please make an apointment to see one of our podiatrists to get a diagnosis.